Broker ASSESS, the broking industry’s most widely-used, authoritative online training and competency resource, has undergone a comprehensive upgrade. The new solution was officially re-launched by BIBA chief executive Eric Galbraith at the British Insurance Brokers' Association (BIBA) 2012 Conference and Exhibition today (Wednesday 16 May). The upgraded Broker ASSESS has been developed to deliver a more complete, engaging and cost-effective online learning and development experience to help brokers better meet the challenges and professionalism demands of their ever-evolving industry. 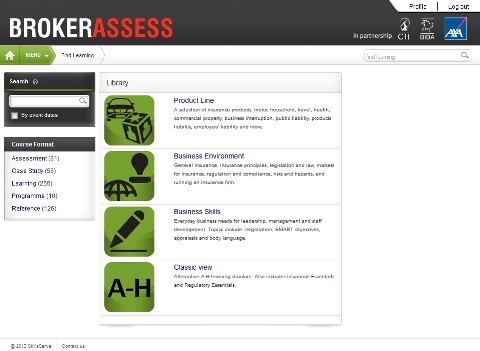 Broker ASSESS provides comprehensive support for compliance training and CPD needs. Hosted on Unicorn Training’s SkillsServe platform, it has a highly intuitive user interface, easy to use search and browse for content features, more powerful management and reporting functions, and excellent integration with wider CII and BIBA broker services. The unrivalled range of industry specific content focuses on improving brokers’ understanding of how regulation impacts on their everyday business practices. The new content includes a series of role-specific, interactive case studies focused specifically on the broker market plus a range of other context-based resources. In February this year Broker ASSESS was awarded 2012 Microsoft Learning Technology Solution of the Year at the Learning and Performance Institute (LPI) awards. Steve Jenkins, director of financial markets for the CII, said, “We have totally refreshed the content to support regulatory learning and assessments. Broker ASSESS is now even simpler and more intuitive to use. One touch reports are available for managers, compliance and training managers and we will shortly be introducing online appraisals and file checking to support brokers." Broker ASSESS is being demonstrated on Stand E70 at the BIBA Conference.